After a summertime lull of about two months, local boxing finally returns Saturday night with an Atlantic City fight card headlined by Teon Kennedy, one of Philly's best rising stars. 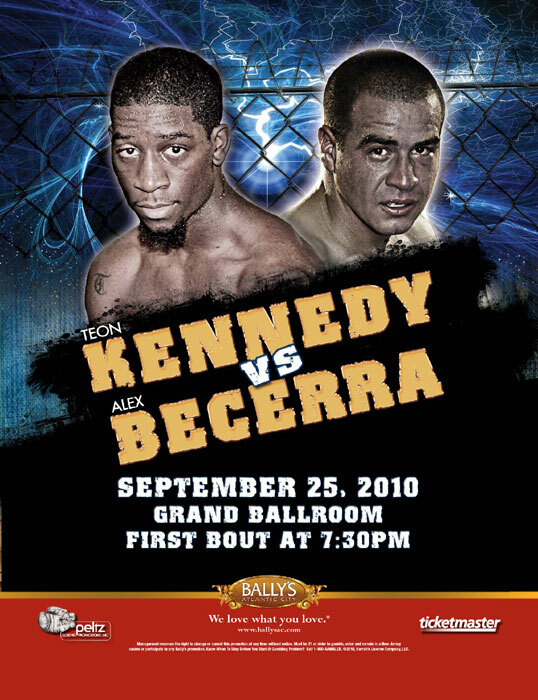 Kennedy, already the USBA title holder, faces Alex Becerra in a 12-round bout for the vacant NABA super bantamweight championship. The Philadelphian's USBA belt will not be on the line. Teon goes in with a record of 15-0-1 with 6 KOs, while Becerra brings a record of 20-8 with 9 KOs. These days, all eyes have been on Kennedy, who has recently turned from the "Technician" that inspired his nickname to an all-out brawler. He's won exciting, bloody punch-outs that have thrilled fans but confused his core supporters, who think he should be breezing through his foes. Becerra has lost five of his last seven bouts, including three by KO. So he may not be the one to truly test the Teon, but it will be interesting to see what Kennedy shows up. On October 4th, Teon Kennedy will receive the Briscoe Award for participating the "2009 Philly Fight of the Year". His memorable bout with Francisco Rodriguez was the best bout of the year, but was overshadowed by tragedy when Rodriguez died two day after the fight. Francisco's family will accept his Briscoe Award. Also on Saturday night's card, Dennis Hasson (10-0 / 3 KO) will take on Tommie Speller (5-4 / 3 KO) in an interesting super middleweight fight scheduled for eight rounds. Last time out, Hasson appeared to finally be shaking off his amateur style in favor of a more aggressive technique. Speller, a battle-tested warrior, should be a good test for Dennis. Big Poppa Speller should invite a fight, so we'll see if Hasson has turned the page on his long amateur career. Rising Ronald Cruz takes on Dillet Frederick in a junior welterweight six-rounder. Cruz has impressed thus far and seeks his tenth straight victory against the 7-3-3 Floridian. A quartet of four-rounders fill out the latest Peltz Boxing show at Bally's.